Do you ever have them bad days where you just want to lie in bed and do nothing, but you have a million things to do on your "to do list", well not a million, maybe ten. I always have these days, and it can be so difficult to get through them too, especially when you don't have the motivation either. One thing to remember is everyone goes through a bad day, whether this is on a daily basis, or maybe even once a week; it is so common and it's nothing to be ashamed of. Sometimes bad days only last for a few hours, or they last the whole day but there is always something out there to lift your mood, you just need to find what that something is. You cannot go wrong with a good book. If I'm ever in a bad mood, I found reading a good book is a way to rest my mind and it takes my mind off everything that's going on around me. Books are so special, because they take you to a place where you can't go in real life, and it's all very magical! I love it. If you're interested in the books I loved to read, then let me know! My favourite thing to do ever, is movie days! I am definitely a movie person and our shelves are over filled with dvd's yet we still buy more. Watching a movie is a great way to relax and I've found I can still get things done off my to do list even while watching a movie which is good enough for me! I never used to burn candles, however I have found in the evening when I'm feeling down or a little bit stressed, a candle light is very comfortable and the beautiful glow soothes away any stress. The aroma that comes from candles too also sends positive feelings to our brains and lifts all of our spirits, leaving you in a great mood! My favourite candles are the salted caramel by Yankee Candle or anything which includes vanilla, cookies or baking. I absolutely love using my mindfulness colouring book when I'm having a bad day or feeling stressed as it calms my mind and occupies my hands, meaning I also don't bite or pick my nails - two goals in one! Psychologists express that mindfulness colouring is very much like meditation as it focuses attention on simple tasks which include a repetitive motion. By concentrating, we replace negative unwanted thoughts with peace and positive thoughts, while using the variety of colours to block away any unwanted, intrusive thoughts. Plus you feel like a child again with no care in the world which is always a great thing. I believe it's so important to take time for yourself, especially if you're having a bad day because of work, education or even if it's your blog which is making you feel not at ease. When you spend so much time doing one thing, you can begin to feel worked up and frustrated because you need some sort of change in your life, and this is where individuals forget to do something for them, to make them feel happy! So if you've been working for ten days straight and haven't done anything for you in a while, then go do something that you love! Maybe take a trip to a spa, or go out shopping with friends? Something we all forget to do when we are struggling is to simply ask for help and I feel like this because we're ashamed of feeling maybe weak? Or we want to be able to do something for ourselves, but when we're unable too, we don't want this to come across as a negative thing? If you're struggling with something in your job, find someone who will know a solution. If you're struggling at school, college or even University, speak to a staff member because they'll know exactly what to do. If you're a blogger who needs a little motivation, or you want to change something about your blog but don't know how, the blogging community is your best friend and we are all here to support one another. There is nothing wrong with asking for help when you need it. This links in with making time for yourself, but I feel like you should do something you love every single day to rest your mind. I personally love reading, blogging and watching youtube, they all make me feel relaxed and at ease so I ensure I have an hour each day to do at least one of these, if not an hour for each of them. Although I do have a busy schedule having a part time job and studying at University, you can always make time for something you enjoy. This is my personal favourite and there is something about baking which is very therapeutic. Whether this is because you're using your hands and concentrating on something, I'm not sure but I love it. When I'm having a bad day, I'll always make time to bake as it instantly puts me in a good mood. By making something from scratch and putting in my 100% to make something perfect, I have so much positivity running through me when I have completed whatever it is that I am baking. This is a fairly simple one but it's so important to think positive. By waking up every morning and having one positive thought, this can make such a difference to the rest of your day. By doing this every single day, you know you're going to have a great week. I absolutely love quotes and I have found this is one way I stay positive when having a bad day. Last but not least, just breathe. Just because you're having a bad day today, doesn't mean you're going to have a bad day tomorrow. Everyday is a fresh start. Breathing is also a great way to refresh and relax your mind which is why I also suggest a hobby such as yoga! I'd love to know if these tips have helped you! Love it! I particularly love to colour, it's nice to just unwind with or have a nice bath haha. 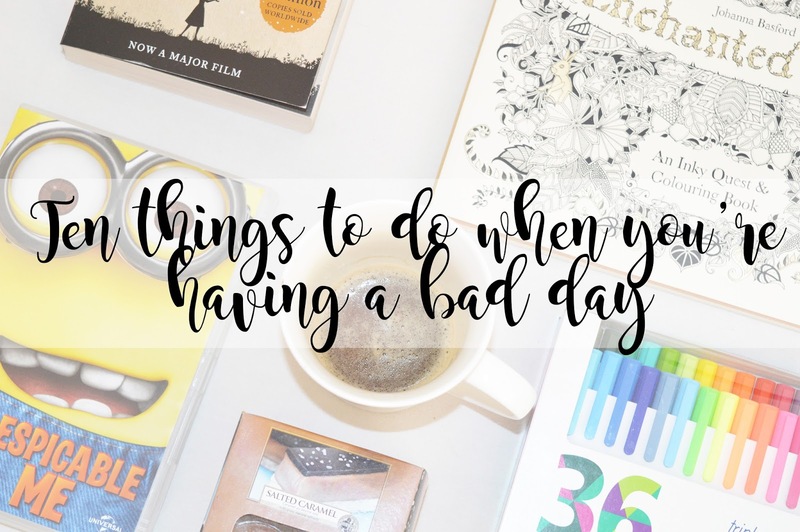 All of those are great tips for getting through a bad day. I agree with movie days, they tend to make me feel better. I always buy myself some sweet and salty popcorn and I tend to forget about the day. another lovely post, have been reading your blog for a while now.. just noticed you're in hertfordshire! i'm in st albans haha.